Livingston, April 16, 2014: Brian Broussard addresses the media at the athletic field house conference room at Livingston High School. Brian Broussard has been named LISD Athletic Director and head football coach by the LISD school board of trustees. Broussard is a graduate of Howard Payne University where he played 1990 – 1993. He was team captain, academic all-conference and part of the undefeated conference champions in 1992. He was a graduate assistant when the team repeated the conference champion title in 1994. Broussard has more than 13 years experience with 4A and 5A school districts just finishing this past football season as Defensive Coordinator with Clear Brook High School. The six years at Clear Brook he also served as offensive coordinator, offseason coordinator to a team that was Area Finalist in 2008 and 2012; Bi-District finalist in 2007, 2008, 2011, 2012; District 24 – 5A runner up in 2012; District 24 – 5A Champions in 2008. 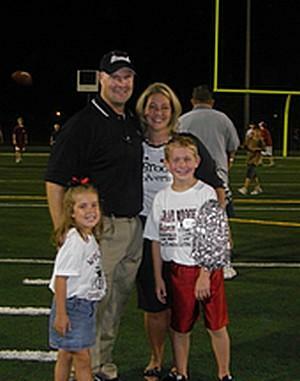 Prior to coaching at Clear Brook ISD, Coach Broussard spent 10 years at Clear Lake ISD as a football and track coach with 2 district football championships and 3 district track championships leading their list of accolades. Broussard and his wife Andrea have 2 children, 14 year-old William James and 10 year-old Anna Elizabeth.